Wash and wax your boat in minutes � without using a hose, bucket, brush or water! Marine 31 Stern to Bow Waterless Wash & Wax Concentrate with Carnauba provides an environmentally-friendly way of washing and waxing your boat. No hose, bucket, brush or free-flowing source of water is required. Formulated with high-lubricity cleaning agents and real carnauba wax, Marine 31 Stern to Bow Waterless Wash & Wax Concentrate with Carnauba cleans, shines and protects your boat in minutes; it can even be used in direct sunlight! Marine 31 Stern to Bow Waterless Wash & Wax Concentrate with Carnauba is highly concentrated. It takes just 1 ounce of concentrate to make 32 ounces of ready-to-use waterless wash! Do the math and you�ll quickly discover that a 16 oz. bottle of Marine 31 Stern to Bow Waterless Wash & Wax Concentrate with Carnauba creates over 4 gallons of ready-to-use waterless wash! All hands on deck! Marine 31 Stern to Bow Waterless Wash & Wax Concentrate with Carnauba will quickly become one of your most reached for marine care products thanks to its time saving abilities. If your boat isn�t in need of a traditional wash with a hose and bucket, a few quick sprays of Marine 31 Stern to Bow Waterless Wash & Wax Concentrate with Carnauba will remove dirt and grime, restoring a just-waxed shine in minutes. Highly concentrated formula means one 16 ounce bottle of concentrate creates over 4 gallons of ready-to-use waterless wash! Marine 31 Stern to Bow Waterless Wash & Wax Concentrate with Carnauba is formulated using high-lubricity cleaning agents that safely lift dirt and grime, allowing it to be wiped away without scratching the finish or creating a smeary mess. The high-grade carnauba wax imparts a glossy, slick finish that will trick friends and family into thinking you just spent hours waxing your boat! What�s more, Marine 31 Stern to Bow Waterless Wash & Wax Concentrate with Carnauba is harbor safe and eco-friendly! Don�t stop at the outside of your boat! Marine 31 Stern to Bow Waterless Wash & Wax Concentrate with Carnauba can be used on most hard surfaces including gel coat, stainless steel, plexiglass, composite surfaces and more. The protective properties of the high-grade carnauba wax will prevent dust and dirt from sticking, leaving treated surfaces cleaner, longer. 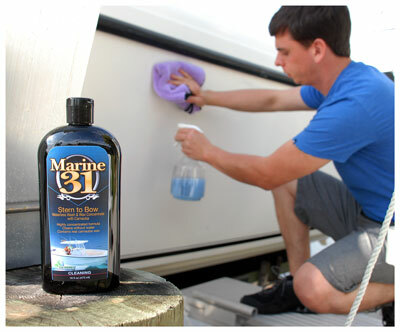 Use Marine 31 Stern to Bow Waterless Wash & Wax Concentrate with Carnauba as often as you would like. Formulated using advanced UV inhibitors, Marine 31 Stern to Bow Waterless Wash & Wax Concentrate with Carnauba will provide the utmost in surface care protection on all gel coat and fiberglass surfaces. Boats regularly cleaned with Marine 31 Stern to Bow Waterless Wash & Wax Concentrate with Carnauba will resist future staining.